Platinum Vintage Art Deco ladies wrist watch with 100 diamonds! : Description par door Adin Bijoux Anciens. Platinum Vintage Art Deco ladies wrist watch with 100 diamonds! 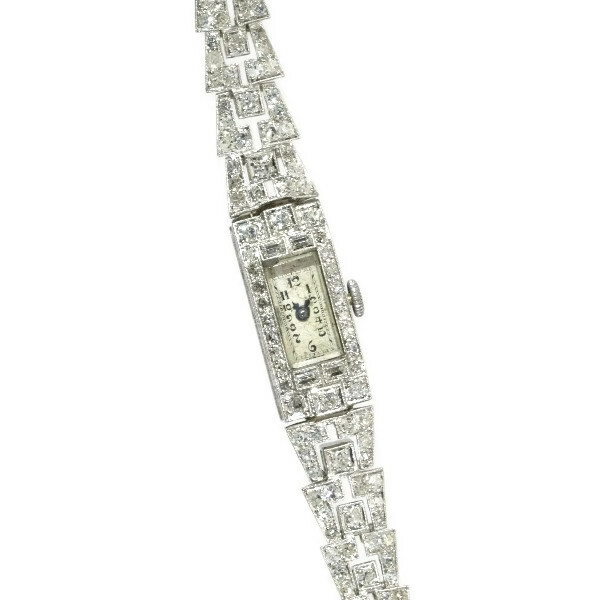 A total of 96 single brilliant cut diamonds is encrusted in this platinum Art deco ladies watch from 1920, while its watchcase is especially flanked with four baguette cut diamonds. Eight degrading pierced trapezia with a central square-set diamond establish an overall look of geometrical scales as its watchband. No more rushing, time will just slowly slither by with this astonishing jewel on your wrist. Diamonds: 96 single brilliant cut diamonds (also called 8/8) with a total estimated weight of approx. 2.70 crt. and four baguette (long rectangular) cut diamonds with an estimated weight of approx. 0.12 crt.